Morecambe produced a stunning late comeback to keep up their fine away form and shock promotion-chasing Bury. Two goals in six second-half minutes from substitutes Padraig Amond and Paul Mullin saw the Shrimps record a memorable victory at the JD Stadium. Jim Bentley’s side looked set to be heading for only a second away defeat in 10 games as Bury looked to build on a first-half lead. But the Shrimps were rewarded for their never-say-die attitude. Amond levelled on 80 minutes when he was played in on goal by a delightful through ball and made no mistake. The winner came five minutes later after a howler from home keeper Nick Pope. The Charlton Athletic loanee miscued his attempted clearance straight to Jamie Devitt and the Irishman’s goalbound effort from 30 yards out was touched into the empty net by Mullin. The hosts took the lead in the 18th minute with a scrappy goal. The home side created space down the right hand side and Andrew Tutte was given space to send over a cross which was met by Danny Nardiello. 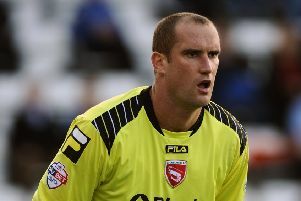 His touch beat Danny Ward in the Morecambe goal but striker Tom Eaves got the final touch to score from two yards out. The home side then created a string of chances to add to their advantage but were denied by Ward on several occasions. The on-loan Liverpool goalkeeper produced a fine save low to his left to deny former Preston North End man Danny Mayor and then showed great reflexes to tip away a close-range shot from Nardiello. After being second best for long periods Morecambe came into the game after the half hour with Aaron Wildig shooting inches wide and Kevin Ellison not far away from getting the final touch to a throw that bounced across the six-yard box. Bury continued to look dangerous going forward and Tom Soares was denied a second on 43 minutes by a superb goal line clearance from Andy Parrish. The Shrimps made a change at the break to bring on Devitt and they started well. Ellison headed a Widlig cross over and the Shrimps’ veteran was denied a free header on goal with a last gasp El Abd clearance. The home side continued to impress going forward and Ward had to be at his best again to make a fine save from Craig Jones before the same Bury player failed to bundle home Chris Hussey’s left-wing cross from close range when he looked sure to score. Ryan Lowe did beat Ward from close range only to see his effort ruled out for offside, a decision that proved vital as the Shrimps shocked a side with eyes on automatic promotion. Bury: Pope, Jones (Hope 80), El-Abd, Cameron, Hussey, Etuhu, Tutte, Mayor, Nardiello (Lowe 55), Eaves (Adams 70), Soares. Subs not used: Lainton, Sedgwick, O’Brien, Holding. Morecambe: Ward, Beeley, Parrish, Edwards, Goodall (Devitt 46), Wilson, Widig, Fleming, Kenyon, Redshaw (Mullin 83), Ellison (Amond 76). Subs not used: Arestidou, McGowan, Drummond, Wright.